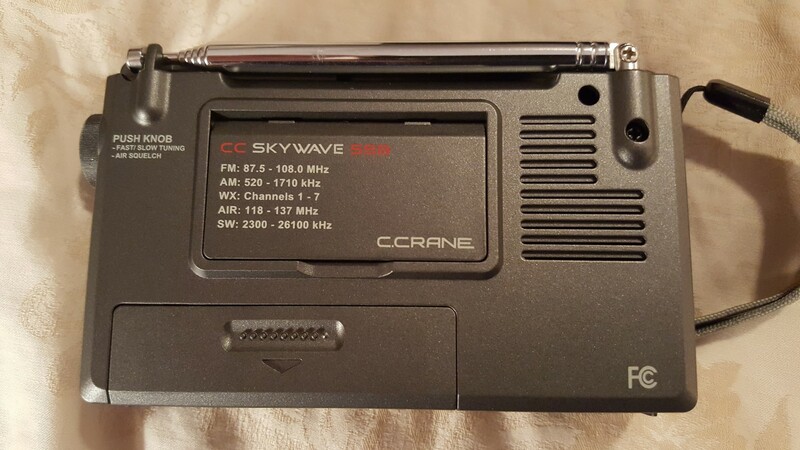 A much-anticipated addition to C Crane’s extensive (and excellent) line of portable radios, the new Skywave SSB is a worthwhile upgrade to the still available CC Skywave. The initially announced price of $169.99 has been reduced to $149.99 which includes a carry case, reel-up antenna and CC buds, which represents a great price for a radio with all the capabilities of the Skywave SSB. For those who are familiar with the original Skywave, the new SSB model is externally similar (with some cabinet restyling) but has been totally redesigned internally, adding SSB (Single Sideband) reception along with slightly improved RF performance and audio quality. The Skywave SSB really is the “Swiss Army Knife” of portable radios, utilizing not one but two DSP chips in order to cover not only standard AM/FM/SW but also NOAA Weather and Air Band, in a small size which is ideal for the traveler. 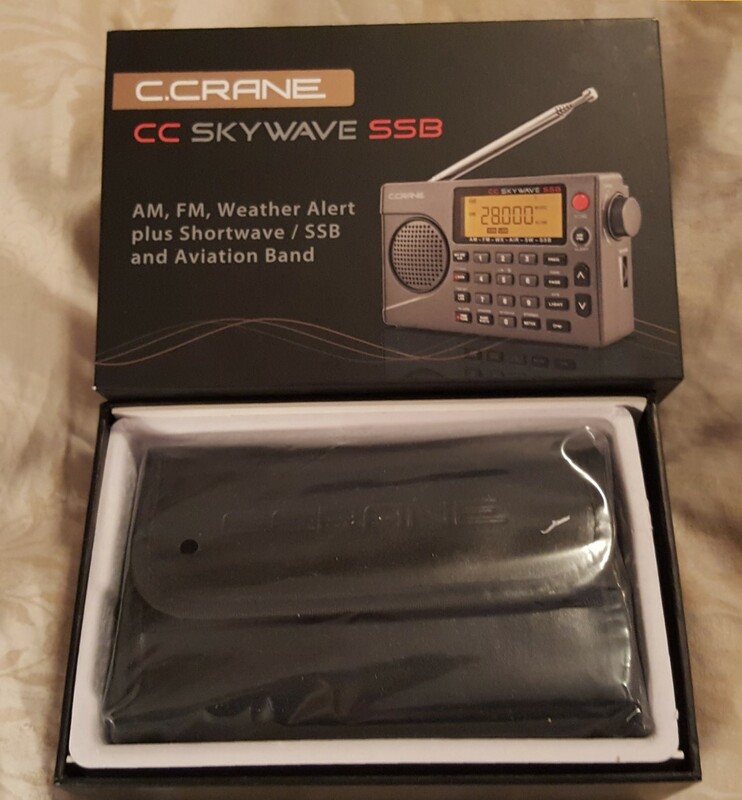 The original Skywave comes in a plastic blister pack while the new SSB model arrives in a box which also includes the carry case (a welcome addition), reel-up antenna and CC earbuds. Checking out the new Skywave SSB I’ve got to say that it offers a great feature set and friendly ergonomics. This compact receiver offers good performance along with unusually complete band coverage which seems particularly well-suited to travelers. 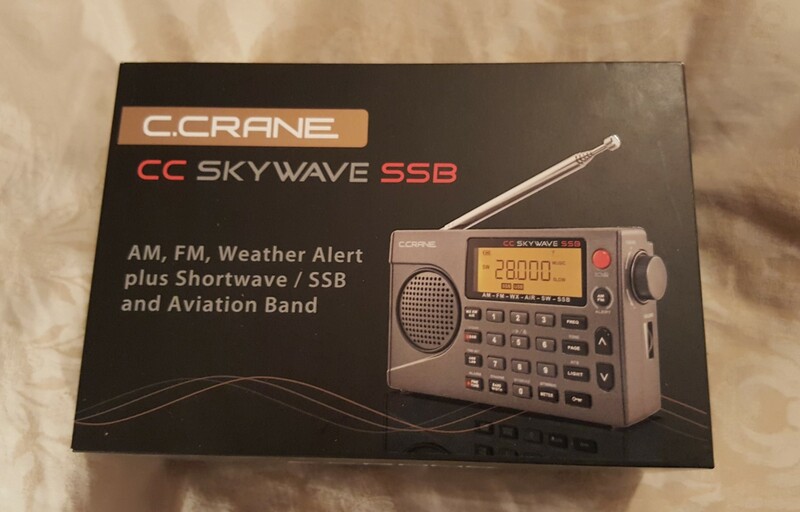 The fact that C. Crane has managed to cram so much flexibility and performance into such a compact design is a testament to their passion for radios and the radio hobby. First, I compared the new model with the original Skywave which I had previously rated highly. I’m happy to report that the new SSB version is as good and even a tad better in a few ways although overall it is very close. In addition to SSB capability, the AM/SW/Air reception is just slightly better. Very hard to notice but on some weaker signals the SSB model seemed to have more reserve volume capability…I was able to get more recovered audio out of some very faint signals. On most normal reception one would say they are identical. I also noted the whip is now longer at 21” compared with 16” on the original Skywave. There is a very subtle improvement in tone quality, although sound quality is not a strong point here. One doesn’t expect wide range audio out of such a small, communications-oriented device, but the original Skywave and the new SSB model are quite trebly sounding – great for voice clarity which is obviously the design goal. I tended to set mine to 3KHz AM bandwidth and use the Voice rather than Music setting to reduce the high frequencies a bit. SW Reception was very good for a compact travel size radio. In fact, it fared well in a side-by-side comparison with a Tecsun PL-660 which is a well-respected radio but double the size of the Skywave, although the PL-660 showed a bit better sensitivity to very weak SW signals as expected. The Skywave was excellent however for its size category. AM Reception was also great for a small radio limited to a small ferrite rod antenna and it too it was amazingly close to the PL-660. After tabulating the results of a 17-station comparison the Skywave SSB matched the larger Tecsun on the majority of the signals – on a handful the Tecsun did slightly edge out the Skywave. Again, the Skywave is half the size so this is a great result for a compact radio. FM Reception is excellent. DSP technology has helped FM portables outperform their pre-DSP ancestors considerably and the Skywave SSB is a simply amazing FM radio by any measure. It’s ability to receive and separate crowded FM signals is almost as good as it gets. SSB Performance: Here the news is also good. I found it very easy to tune SSB for natural audio…at least as easy as any of my other portables. I compared it with a Tecsun PL-880, PL-660, Eton Satellit Executive and other radios, and although the larger radios were a bit more sensitive, the Skywave SSB was just as good as the best of them at SSB Fine tuning…this is excellent performance. The normal Fast and Slow Tuning speeds are enhanced by an SSB Fine Tuning mode with 10 Hz resolution which is fine enough to achieve natural audio easily. I then added the reel-up antenna and the Skywave now matched or beat the larger radios and was in fact better for tuning SSB than the PL-880 which brought up the rear in this comparison. (The PL-880 is overall a great radio but its SSB is not as good as other competing portables evidently due to oscillator instability). 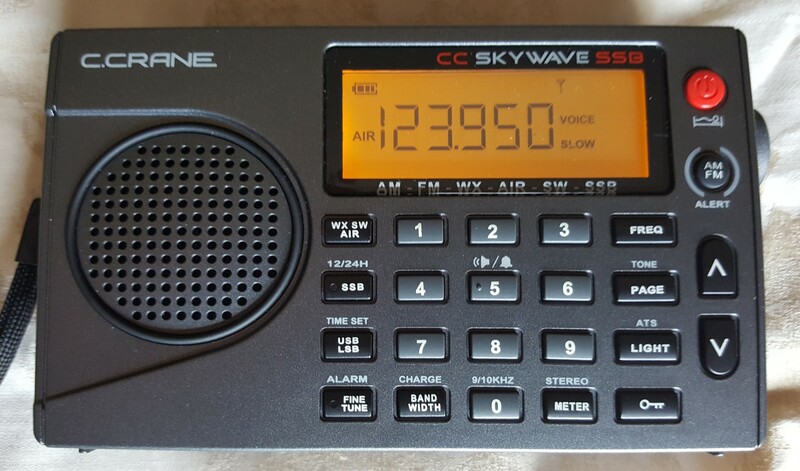 Also, many people have asked if the Skywave SSB will do SSB on the AM band so it can be used in so-called ECSS – Exalted Carrier Single Sideband Mode (do a Google search for ECSS AM) to enhance AM reception and the answer is, “Yes it does”, and it works well in this mode. Weather Band is also very sensitive. I can receive several NOAA Weather stations from distant locations on radios with excellent Weather Band performance…the Skywave is one of them – a great Weather Radio and the Alert feature could be a lifesaver. As with all portables it is necessary to use AC Power for extended periods in Alert mode as the radio draws current while in this mode. Conclusion: The Skywave SSB will definitely appeal to people who love small marvels of technology. Back in its heyday, Sony offered a few high quality, miniature multi-band radios at extremely high prices which sold very well– radios like the popular ICF-SW100S and ICF-SW07. I bought the ‘SW07 in 1999 and paid about $400 for it (which was a discounted price) – that would equate to $589.22 as I write this in 2017. Considering that the Skywave SSB offers superior RF performance, more bandwidth options and better audio along with Air Band and Weather Band, along with far better FM reception, the price seems like a bargain. And if you’re on a budget and don’t need SSB, the original Skywave will continue to be available at lower cost. Either one is a great item to pack in your travel kit. Recommended! Get one. 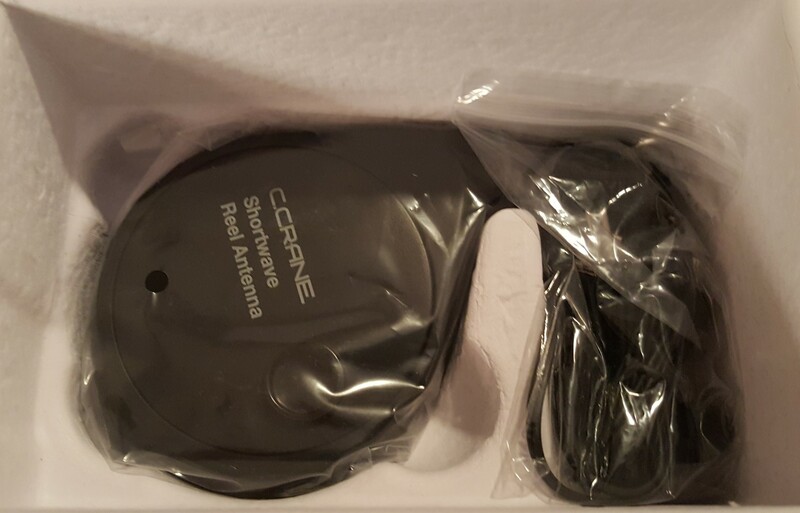 The Skywave AC Adapter is very special and is a valuable accessory. Many of today’s radios, like the Skywave and Skywave SSB require a USB Mini plug AC adapter to charge their batteries if you decide to use rechargeables. Almost all such power supplies are of the lightweight, switching variety, such as the type commonly used to charge cell phones and other devices. These power supplies are fine for charging purposes but generate so much noise that the radio can’t be listened to while connected to AC power…the noise just obliterates most AM/SW reception (although FM is mostly OK). Computer USB ports are just as noisy…again, fine for charging internal batteries but useless for powering the radio directly. It seems that low-noise transformer-based AC Adapters have almost totally vanished from the scene…virtually every supply you can find is a switching type and useless for listening to AM or SW…the give-away is their lightweight which means there is no power transformer used – such switching power supplies are great for cell phones but not for AM/SW radios. Leave it to C. Crane to produce a high quality, transformer-based power supply for the Skywave. This power supply seems to be completely quiet. I tested it on my Skywave SSB and could not detect any added noise from the Skywave AC Adapter. I tuned the radio to several very weak AM and SW signals while on battery power, then plugged in the AC Adapter and heard absolutely no increase in noise level. For the first time I can listen to these radios if needed powered directly by AC…this is great if you inadvertently find yourself with dead batteries when you want to use your radio. The Skywave AC Adapter is well-made and has a standard USB 5 volt 300 ma output, which is fine for the Skywave and most smaller radios. It is a bargain at $14.95 and I recommend it highly. This seems to be a one-of-a-kind product at a ridiculously low price of $14.99 so I bought two just to have a spare. 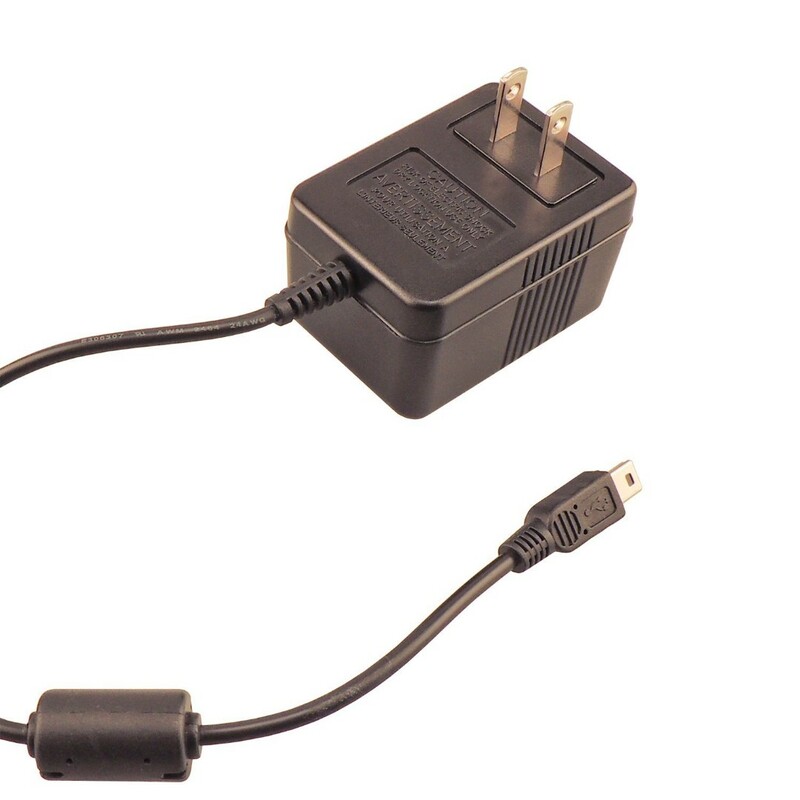 By the way, if you want a similar, totally quiet USB AC Adapter for radios which need more than 300 ma current, the C. Crane Witness Plus AC Adapter is another bargain. At $39.99 it will charge or directly power your larger radios such as the Tecsun S-8800 and PL-880 without adding any noise to their AM/SW reception and will charge them faster than most small USB chargers. It is only available as part of an accessory pack for the CC Witness Plus radio but even if you don’t need the other parts of it, the adapter is the only noise-free 900 ma USB charger I’ve seen – another one-of-a-kind product and is easily worth the price…I use mine with all my larger USB-equipped radios.